This dazzling, glittery tower will warm up anyone’s coldest day! Three festive boxes are stacked and adorned with a beautiful silver ribbon. The surprises include Chocolate Walnut Fudge, Chocolate Covered Peanuts, 2 oz. boxes of chocolates in flavors of mint, cherry, & peanut butter, truffles, Duo Delights™ Lemon Crunch cookies, malt balls, a gingerbread man shaped cookie, and Winter Spice coffee. What a delightful gift…and so appropriate for the season! Shipping weight: 3 lbs. Measures 6” x 6” x 9 1/2”. Case Packs: 6. Prices shown per piece. 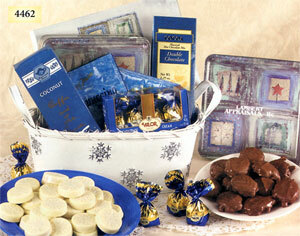 Our useful snowflake design winter basket contains 8 oz. of Pecanbacks® in a Winter Squares tin, 6 oz. of Vanilla Peanut Butter Snowflakes, 1.5 oz. foil wrapped chocolates, cocoa, tea biscuits, and 2 envelopes of Vanilla cappuccino. Shipping weight: 3 lbs. Measures 12” x 5 3/4” x 9 1/2”. Case pack: 4. Prices shown per piece. Engraving area: 3 1/2” x 1”. 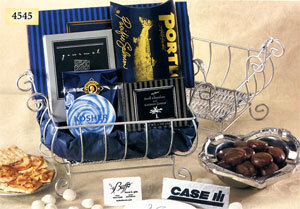 Attractive silver wire basket is filled with gourmet Kosher Almond Thimble Cookies, Smoked Salmon, crackers, and lots of our delicious, Kosher Dairy certified home-made chocolates! Shipping weight: 3 lbs. Measures 11 1/4” x 7” x 10 1/4”. Case pack: 4.Prices shown per piece.